Q: I was walking the dog along the Byron Avenue path across the road from Maplelawn when I noticed some new trees had been planted there. Upon closer inspection I realized they were apple trees. They’ll obviously take a few years to bear fruit, but I was surprised to see them because I didn’t think the City of Ottawa planted fruit trees or bought them from Canadian Tire as the tag indicates. A: You’ve stumbled upon someone’s personal guerilla tree planting project. I emailed a few photos to the folks at Hidden Harvest to see if they knew anything about it. According to Hidden Harvest co-founder Jason Garlough, they probably aren’t City trees as they usually choose larger stock and add more mulch around the base. One of the varieties the mystery tree planter chose is called Mutsu. It’s one that is typically planted in orchards around Southern Ontario. Garlough said it probably should survive with a bit of TLC. Andrew Hickey, Manager of Community Relations and Communications for Coun. Hobbs says the apple trees “seem to be a guerrilla planting.” What’s more, since Byron once had a streetcar line he has “some concern about the soil.” The soil is to be tested. 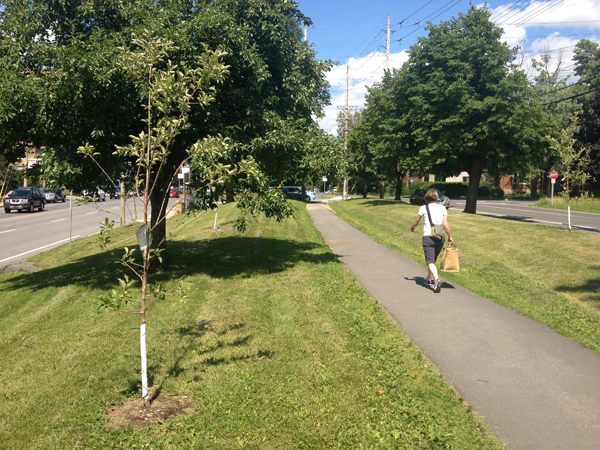 The City of Ottawa prefers that residents suggest locations for tree plantings but leave the actual tree planting decisions to the Forestry Department. Hickey says tree planting is best done in the spring or in the fall when it’s not as hot. City planted trees benefit from frequent watering and extra care. What we do know is that someone has taken it upon themselves to plant three different varieties of apple along the Byron path in the heat of the summer, so let’s just hope that our guerilla gardener is also a guerilla waterer. If you live in the area, dear reader, and wish to see the trees thrive, it might be a good idea to bring over a bucket of water, or three, when it gets hot. Do you have a spare fruit tree? Hidden Harvest is an Ottawa organization that promotes urban fruit and nut picking as well as tree planting. Residents with fruit or nut trees on their property can register their trees to be harvested. When it’s time to pick the fruit from one of these registered trees, Hidden Harvest sends a notice to their database of volunteer pickers. For more information go to ottawa.hiddenharvest.ca.